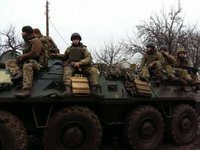 The Ukrainian military positions in Donbas have been attacked three times so far on Monday, injuring two servicemen as a result, the Joint Forces Operation (JFO) said on its Facebook page on Monday. "As a result of the attacks, two Joint Forces servicemen were injured. The defending units responded with adequate [return] fire, forcing the enemy to stop the attack," the post said.